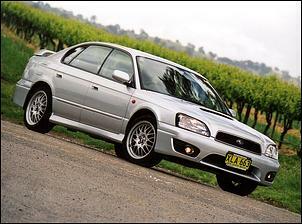 We recently performed a road test of the Australian market Subaru Liberty B4 ["Subaru Liberty B4 Twin-Turbo"]. 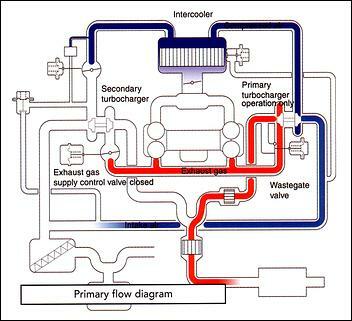 Now we'll give you a technical explanation of the new super Subie - like, how does the sequential twin-turbo system work? 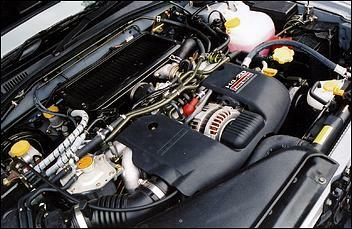 The B4 is powered by a 'phase 2' all-alloy DOHC, 16-valve, intercooled turbo 2-litre boxer four. According to official Subaru literature, there are several advantages to the boxer design. Due to the balance afforded by horizontally opposed cylinders, the crankshaft requires less weighting and there is no need to install balance shafts. This results in reduced noise, vibration and less power loss. Strength is also an advantage of the boxer design - the crankshaft is sandwiched between the left and right hand crankcases and is supported by 5 main bearings. The low and wide engine structure also lowers the vehicle's centre of gravity and improves mass distribution. Working from the crankcases out, the 'phase 2' engine sees the crank thrust bearing relocated to the rear of the shaft - this reduces transfer of natural frequencies to the transmission, resulting in improved NVH. Pistons are all-new in the B4. Despite being made from forged aluminium, the pistons are heavier (162 up from 152 grams) and incorporate solid skirts, reduced piston pin offset, a molybdenum coating, reduced top-land to cylinder clearance and flat-top combustion surfaces. Improved off-boost torque comes from a raised static compression ratio - 9.0:1 compared to the Impreza WRX's 8.0:1. The two DOHC, 16-valve heads incorporate a fuel-efficient, low-emission design, with a 'tumble swirl air' motion created by a specially shaped intake port and increased valve angle and lift. The belt-driven camshafts act directly on hollow valve stems. Intake valves are hollow (reducing their mass from 51.6 to 48.4 grams) and the exhaust valves (46.7 versus 50.5 grams) are sodium-filled for more efficient heat transfer. The B4 uses a sequentially staged primary and secondary turbocharger to deliver good throttle response and a wide torque spread. The primary turbo delivers boost in the low rpm and load ranges to deliver 278Nm at 2000 rpm, while the secondary turbo joins in above 4000-4500 rpm. 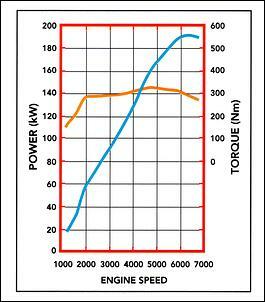 With both turbos boosting, a 320Nm torque peak arrives at 4800 rpm and maximum power (190kW) is seen at 6000 rpm. Note that Japanese-market B4s - running on 100-octane fuel - are rated at 206kW. The primary turbo (located at the left rear of the engine) delivers boost in the low rpm and load range, while the secondary turbo comes in to aid mid-to-high range breathing. 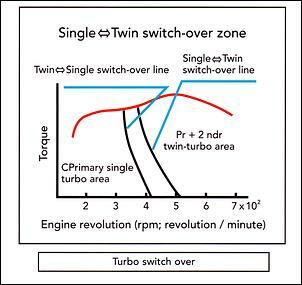 During the primary turbo stage, boost pressure is controlled by a conventional arrangement of an ECU-controlled duty-cycle solenoid and an internal wastegate. 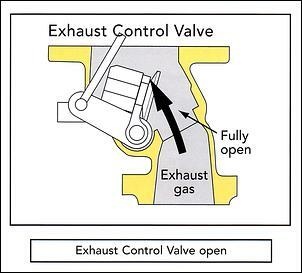 The secondary turbo remains inoperative during this stage, as a separate exhaust control valve (situated on the right side of the engine) remains closed. This valve prevents exhaust gasses entering the secondary turbine. During the 4000-4500 rpm transitional stage, however, the exhaust control valve is partially opened, bringing the secondary turbo up to near-operating speed. 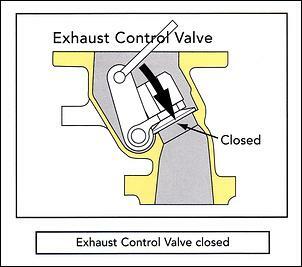 The ECU - working with another duty solenoid and vacuum diaphragm - determines the amount that the exhaust control valve opens. The ECU calculates this amount of valve opening based on the input of a differential pressure sensor that takes feeds from the intake manifold and the outlet of the secondary turbo. 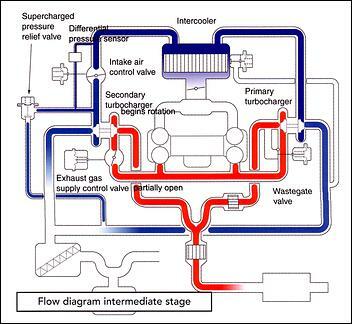 Any boost pressure produced by the secondary turbocharger during the transitional stage is redirected to the atmospheric side of the compressor inlet (between the turbos and air filter). 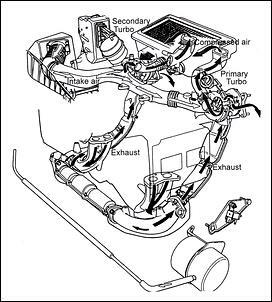 With the primary turbo continuing to supply manifold pressure and the secondary turbocharger essentially bleeding off the boost it makes during the transition, the ECU will determine when to close the pressure relief valve and fully open the exhaust control valve. Once this is done, the ECU will again look at the input from the differential pressure sensor and open yet another valve - the intake control valve (which is mounted between the secondary turbo's compressor outlet and the intercooler). With the intake control valve open, boost pressure from the secondary turbo is allowed to pass through the intercooler (in addition to the boost supplied by the primary turbo). 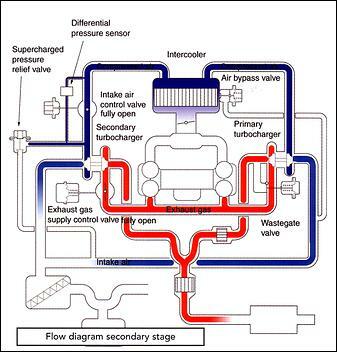 Manifold pressure during the second stage of turbocharging remains regulated by the primary turbocharger's wastegate - there is only one turbine by-pass valve in the whole system. Subaru claims: "The 'staging' between the single and twin turbo operating range, which was quite noticeable to the driver on the previous model B4, has now largely been 'tuned out' by the careful selection of turbocharger size and the controlling mechanisms. As can be seen from this torque curve, however, under some driving conditions it is still possible to detect a slight reduction in the rate of acceleration in the preparatory or intermediate phase that occurs between 4000-4500 rpm." Despite being called twins, the B4's turbochargers are not identical. The primary turbocharger is an IHI VF33 unit, which uses a 46.5/35.4mm 9-blade turbine wheel and a 47.0mm/35.4mm 6 + 6 blade compressor. 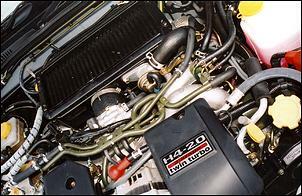 At idle, the turbo spins at around 20,000 rpm and it can go on to a maximum speed of 190,000 rpm. It has a 17mm diameter wastegate opening to bypass excess exhaust gas. The secondary turbocharger is an IHI VF32. On the exhaust side it uses a 46.5/35.4mm 9-blade turbine wheel, teamed with a 52.5/36.6mm 10-blade compressor wheel. It's rated at 180,000 rpm. Both the primary and secondary turbochargers use a floating metal centre bearing - not ball bearings. 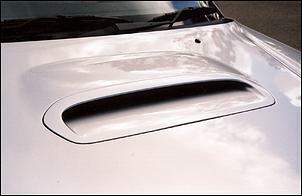 Like the WRX, the B4 uses a bonnet scoop to feed a top-mount air-to-air intercooler. Manufactured by Sanden, the intercooler has an effective depth of 73mm, a width of 140mm and a length of 370mm. With 26 tubes to take induction air from one end-tank to the other, the unit has a 13.37kW heat transfer capacity and reduces 120-130 degree Celsius charge air to 70-80 degrees Celsius (claimed). 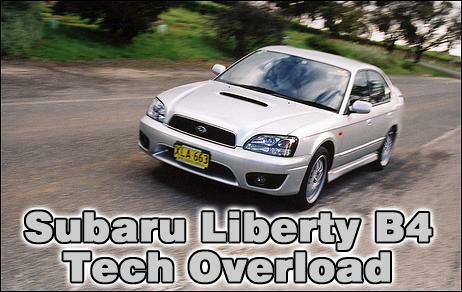 Australian-delivered Liberty B4s come with a longitudinally mounted 5-speed manual gearbox only. It is essentially the same unit that was introduced in MY99 models (which saw the most changes since the Liberty was introduced in 1990). Amongst its list of improvements is increased case rigidity and twice the number of bolts attaching it to the engine (there's now 8 instead of 4). The synchromesh baulk ring, gear docking teeth angles and the double cone synchro on 2nd and 3rd gear have also all been retuned. The B4's 'S type' close-ratio gearset has taller ratios in the first three cogs than the Impreza WRX, but a shorter 4.11:1 final drive ratio counters some of this effect. Interestingly, the gears are now cold forged and shot peened for added strength and a flexible flywheel design is now incorporated to reduce engine vibration reaching the driveline. The pull-type 230mm single plate clutch has increased torque capacity thanks to an 830kg clamping load pressure plate. 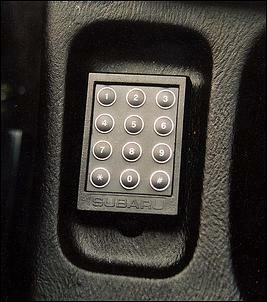 The B4's AWD layout is traditional Subaru. There's a viscous limited-slip centre coupling that - during straight line driving - apportions front-to-rear torque 50:50. Torque distribution at the road, however, is dependant on load distribution and tyre grip. 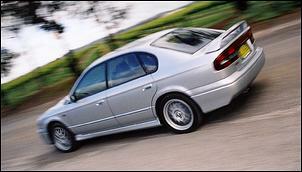 As a result, the static straight driving ratio is 60:40 front-to-rear. Under dynamic driving conditions, however, the torque distribution varies accordingly. The viscous coupling senses rotational speed difference between the front and rear axles and transmits torque to the end with the most grip (which has lesser axle rpm). 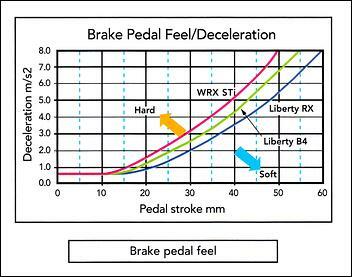 A rear viscous LSD is also used to improve high-speed stability and traction during low speed cornering. The B4 is suspended on the same platform as other Liberty models - MacPherson struts under the front and a multi-link strut rear. The front suspension incorporates cast aluminium L-shaped transverse links and the cross member features a newly devised 'performance rod'. The performance rod is a lateral brace, which improves side-axis stiffness by 500 percent and longitudinal stiffness by 50 percent. This provides more constant suspension geometry under hard cornering. The rear suspension, too, receives an additional support sub-frame to improve rear suspension lateral and longitudinal stiffness (by 200 percent and 20 percent respectively). The front strut is a lightweight Bilstein item. The struts are inverted to deliver higher bending rigidity (thanks to larger damping tube diameter) and less damping fade as a result of increased piston size. Springs are mounted offset so their centreline coincides with the pivot axis. This reduces road shock and - by minimising bump and rebound stiction - provides less vibration. The B4's 1495 kilogram mass is slowed by 294mm ventilated front discs and twin-pot floating calipers and 290mm ventilated rear discs and single-pot floating calipers. An increased diameter vacuum assisted tandem booster gives reduced pedal effort though relatively firm braking feel (see graph). The system is diagonally linked to maintain safety in the event one line should fail, and front and rear pressure control valve are used to balance braking force to suit weight distribution. Maximum braking deceleration from 100 km/h is 0.99g with a 39.4 metre stopping distance. 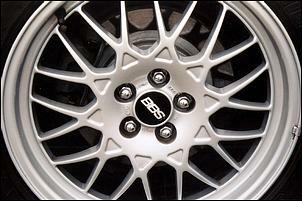 The B4's standard anti-lock braking system is Bosch's latest 5.3i system (which is made under license by Nippon ABS). It's a 4-channel, 3-phase system with the front wheels controlled individually, while the rears are controlled jointly (through the 'select low' method). The select low method uses the rear wheel with the lower coefficient of adhesion to calculate the brake line pressure applied to both of the rear wheels. A major advantage of the new system is the increased level of wheel speed control afforded by the 3-phase control cycle, which now operates at 18MHz (up from 12MHz) and has increased ROM capacity (32kB up from 12kB). Under driving conditions, the result is around 50 percent less yaw moment (oversteer/understeer attitude) when one side of the vehicle is braking on ice and the other is on asphalt. One-third the amount of steering correction is needed under these conditions. The aforementioned 'select low' method of rear braking force, together with electronically delayed build up of braking force at the front wheel with a high adhesion coefficient and negative steering roll radius, maximises chassis stability under braking. A combined key, remote central locking transmitter and immobiliser transponder protects the Liberty B4 from theft. Once the key is inserted into the ignition barrel and switched on, an antenna amplifier (positioned around the ignition barrel) reads the transponder code and transmits it to the engine management system. Without the correct code sequence, the engine is not allowed to start. In addition to the key immobiliser, Subaru Australia also installs a dual-stage security system (as came fitted to previous Impreza STis). The remote locking transmitter represents the first stage of security, while a console-mounted numerical keypad forms the second stage. To disarm the 6 points of immobilisation, the correct four-digit code must be entered into the keypad. The system also features an anti-hijack, mode, intrusion alert, false alarm prevention, internal screamer siren, infrasonic sensor, valet mode and anti cross-pollination software. The B4's instrument cluster is back-lit and delivers excellent visibility under all conditions. The clock rings, pointers and the calibration data is sequentially illuminated once the ignition is switched on. American car audio company McIntosh spent 12 months in Japan customising a sound system to suit the acoustics of the B4. 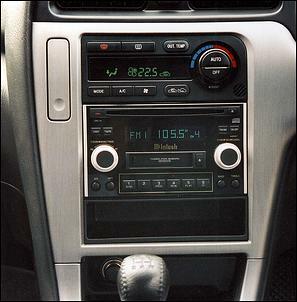 The double-DIN head unit incorporates a single CD player, tuner and cassette deck. The system features a high-performance digital to analogue (D/A) converter, 20-bit Burr-Brown chips, Dolby B noise reduction (tape), dual antenna AM/FM radio and McIntosh's Power Guard technology, which gives low distortion at high sound pressure levels. A 6-band, 4-channel parametric equaliser has also been tuned specifically for the B4. Separate to the head unit - under the front passenger seat - is the system amplifier. The output power handled by each of the 4-channels is 24W and the subwoofer is 60W. The total harmonic distortion of the system is as low as 0.05 percent - comparable to a good home audio system. The speaker system comprises 20mm soft dome tweeters in the sail areas, 165mm polypropylene cone 2-ways in the front and rear doors and a 152 x 228mm subwoofer offset to one side on the rear deck. The whole system weighs about 10 kilograms. An electronically controlled rear muffler is used to keep the B4 quiet at low road speeds. The pipe that leads into the rear muffler is divided in two, with one pipe equipped with a flapper valve. The ECU - working with an actuator and cable - opens this valve when travelling at medium-to-high road speeds. This increases exhaust gas flow. The bonnet of the Liberty B4 is made from 1mm thick aluminium. Once fitted with its intercooler scoop, the bonnet assembly weighs 9.5 kilograms - some 8 kilograms lighter than the steel bonnet fitted to other Liberty models. Body strength has also been improved over the first 1999 current-shape Liberty. Torsional rigidity has increased from the 1999 model's 2.52 x 106 Nm2/rad to 3.5 x 106 Nm2/rad. Flexural rigidity is increased from 4.89 x 106 Nm to 5.47 x 106 Nm. It 190kW at 6400 rpm and 320Nm at 4800 rpm - in comparison, the Australian delivered Impreza STi made 206kW at 6500 rpm and 353Nm at 4000 rpm. Maximum boost pressure is quoted at 0.933 Bar (at 4800 rpm). The engine has a minimum fuel octane rating of 98 RON. Subaru Australia lists the vehicle capable of 0 - 60 mph (not quite 100 km/h) in 6.5 seconds, a 14.6 second quarter mile and a top speed of 220 km/h. Seventy six percent of its body is galvanised metal. Front caliper pot diameter is 42.8mm (x2), and rear caliper pot diameter is 38.1mm (x1). The B4 has a combined cycle driving range of 650km.